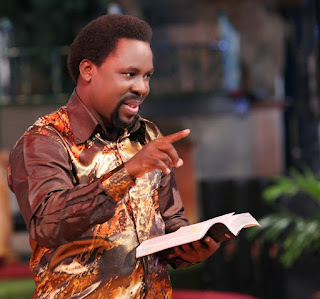 The founder of the Synagogue Church of all Nations, SCOAN, Temitope Balogun Joshua, popularly called T.B, Joshua, has made some shocking revelations about his beginning. Speaking in a interview with Vangaurd, T.B Joshua said he spent over 15 months in his mother’s womb. The renowned cleric also revealed some mysteries that came with his early development, while giving account of his school days. Joshua said, “Don’t forget, that I was born in a rustic village of Arigidi in Akoko, Ondo state, Nigeria; I spent 15 months in my mother’s womb. “My birth and early development was said to be shrouded in mysteries after narrowly escaping a boulder from a nearby quarry which came crashing inches near me in my parents’ house hence the name ‘Temitope’, meaning “what you (God) has done for me is worthy of thanks,” I attended St. Stephens’ Anglican Primary School but failed to complete secondary school due to poverty. “While in primary school, I was referred to as the small pastor and led evangelical activities. My ambition to join the Nigerian Army crashed after the train that was to convey me developed fault along the way and left me stranded for six days.